Child’s Play further investigates my fascination with the development of visual language, focusing on one of the triggers for creativity and visual language development: the act of play. Through combining personal iconography, exploring mark-making, and by referencing the origins of visual language development, my intent is to project myself (in the words of artist Cy Twombly) "into the child's line”. I am excited to see what results from breaking down traditional gallery conventions by asking viewers to touch and move the artworks around and to discover how people interact with my work when they are encouraged to play. Viewers were asked to share and tag their creations @ChildsPlayExhibit. In Child’s Play I reference imagery and the research of Rhoda Kellogg that suggests that the expressive gestures of the infant evolve from certain basic scribbles towards consistent symbols. Every child, in their discovery of a mode of symbolization, (no matter where they are from in the world) follows the same graphic evolution Child’s Play has come out of Joining Worlds, a body of work that investigated the development of my son’s visual language and identified hieroglyph like imagery and mark-making. In this work I attempt to return to these essential basics of expression as a starting place for my creative process. Natasha Smith’s most accomplished work to date, Child’s Play, appropriately privileges the idea of play over work. When you walk into the Langham’s Main Gallery, you are greeted by the coolest playroom ever, one that both a child and a parent would love. The clean design and open space would invite a child to play and calm the parent. Child’s Play is built upon the magpie impulse to pick up a feather or a shell and take it home. This archetypal curiosity of the Tarot’s Fool celebrates a purity of intention and praises place with truth about its beauty, the kind of truth someone who is close to the ground will notice. This thrills the child, and the child in the adult. It’s a rare occasion that an art gallery invites you to touch the art, move it, and make your own pictures with elements of the exhibition. Child’s Play intentionally triggers creativity in the viewer. On opening night while people laughed and shrieked as they moved and rearranged the “Picture Block Game” I was frankly a bit shocked in spite of myself. Three of the pieces that invite participation also suggest the viewer take a picture and post it to @ChildsPlayExhibit. This is twenty-first century play! Child’s Play is the culmination of Smith’s 27 years of printmaking and 18 years contemplating the notion of child’s play and its role in the development of visual language. The pioneer of this work was American psychologist and scholar Rhoda Kellogg. From 1948 to 1981, Kellogg collected and studied several million drawings by children aged 2 to 6 years and found that all children, regardless of language or culture, went through the same stages of artistic development of twenty basic scribbles and predictable placement patterns on the page. Child’s Play pulses with this knowledge. The eponymous piece, “Child’s Play,” consists of sixteen copper etching plates, each 3x3”, exquisitely arranged as a beautiful, rather grown-up looking piece. They are on your immediate left when you walk into the room and are a key to the whole exhibition, in that they are icons that reappear in many pieces. Child’s Play uses circles predominantly, the shape resonant of the breast and often a child’s first drawing. The circle appears in 11 out of the 16 plates. Some are child drawings made by her son Dylan when he was 6 and others the shapes made by all children. Images on the cards also reference ‘sideways flowing line’, as Kellogg calls it. 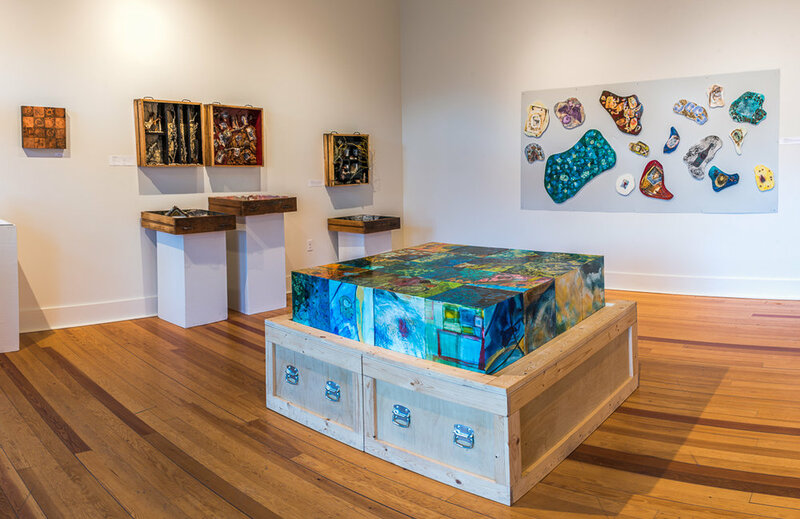 The four Shadow Box Drawers (24”x25”x4”) “Knights,” “Cabin”, “Snapshots”, and “Scrolls” exist for pedagogical purposes. Alongside these and lower than the others (to accommodate smaller kids) is the Shadow Box Drawer that you can play with and which has materials and tac adhesive discretely stored in a secret place. When you have finished, you take a picture and post @ChildsPlayExhibit and put things back for the next person to play with. It’s a little like making a sand drawing. “The Block Game” consists of sixteen one-foot blocks. Each side of the cube is part of a different acrylic painting. The blocks are in the middle of the room on top of a crate that transports them and that looks like it would be fun to play with and in: the luggage handles look magical. As a worn-out parent/grandparent, I appreciated the beauty of a fun-but-elegant storage solution. 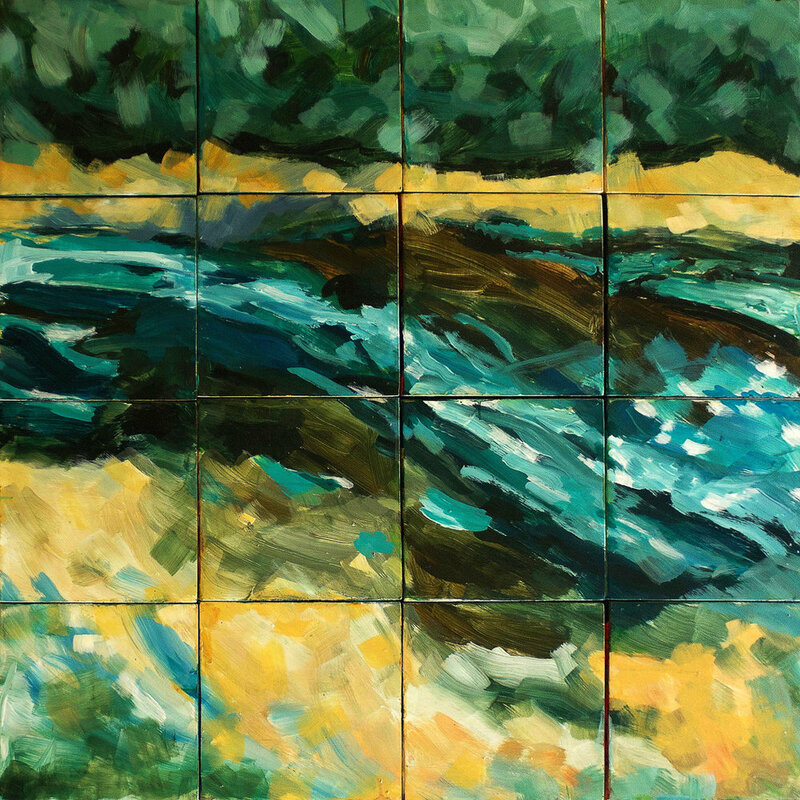 The six paintings on the blocks are all about place, feeling, or seeing it: “River”, “Bird”, “Floating”, “Trees”, “Rocks”, and “Windows”. They’re like a puzzle in that there’s a coherent image if you align the blocks correctly but if you don’t that’s no problem as you get another abstracted image that might be more pleasing to you in that moment. Therefore, they’re more fun than a puzzle. The colour palette for the blocks is harmonious and includes the light turquoise that is repeated throughout the room and I think contributes to the calming mood. Possibilities for fun and beauty can feel infinite in this game and the surface of the blocks are a tactile delight: smooth, hard, and shiny. 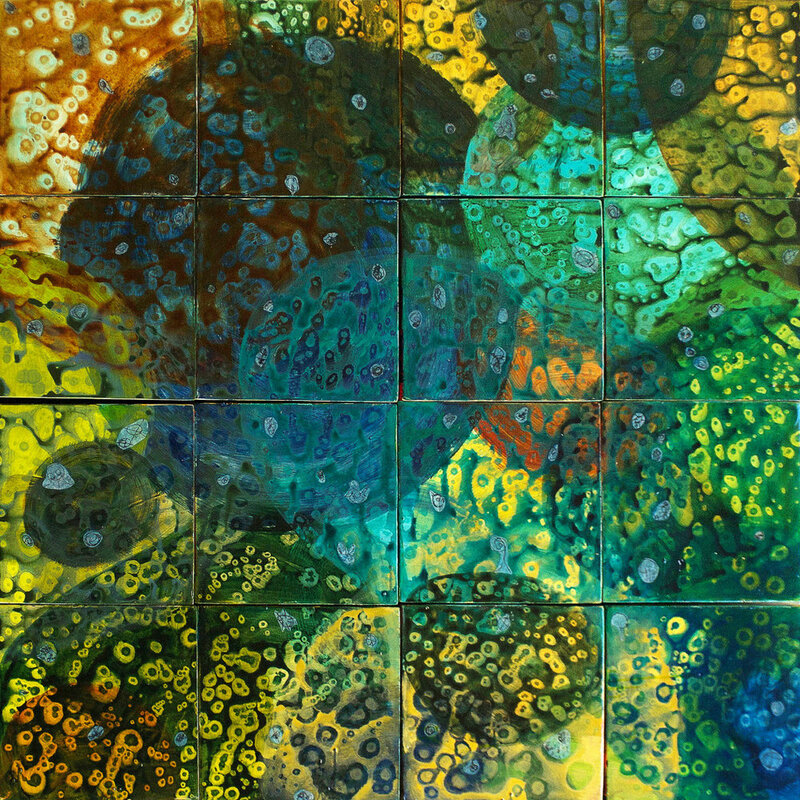 The sixteen Magnetic Cells, works made of MDF, encased prints and natural materials feel like wet, river stones and invite the viewer to stack them on the magnetic board (4’x8’). They vary in size from 4”x6” to 24”x12”. I can imagine a small child wanting to lick them. The “Picture Card Matching Game” rests on a beautiful shelf fabricated for the exhibition by Jan Kozlowski, also the maker of the elegant crate I so admired. There are 12 cards (6 pairs) that are 10”x16”. One card of each pair is a collagraph plate (made of natural materials and iconic marks) while its mate is the original print from that plate. However, the pair are not an exact match and demand of the viewer discernment of differences. When they’re not being matched up they are lusciously attractive where they live on the shelf. Playfulness is a part of the sensibility of a printmaker, that ability to achieve a result by thinking backwards and in mirror image. It would be too hard for anyone but a printmaker to also make something of beauty. Smith is a printmaker-turned-painter who admires the use of colour in the prints of painter-turned-printmaker, Helen Frankenthaler (American, 1928-2011). Smith has achieved in Child’s Play colour that resonates with the bright palette of many of Frankenthaler’s prints. The works in this show are also influenced by the courage of which Cy Twombly (American, 1928-2011) spoke when he said that he aimed for the “the child’s line.” When asked what it is about “the child’s line” that intrigues her, Smith said: “The purity and truth of the marks, they are the source.” Child’s Play makes the viewer feel that an ideal childhood is still possible, no matter how old you are. That is part of its power as art.